As a Historic Sites Manager for the State Historical Society, it is easy for me to recognize why historic buildings are worth saving. I appreciate all of the historic sites we have in North Dakota, but I have a certain soft spot for the Stutsman County Courthouse State Historic Site in Jamestown. The courthouse, while certainly beautiful and filled with the ornate details that make people fall in love with old buildings, has captured my heart for a completely different reason. 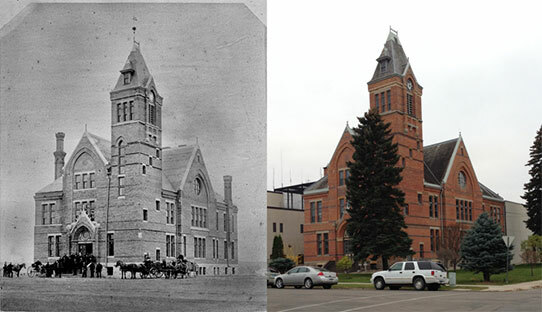 In 1883, the Stutsman County Courthouse was completed in what was set to be the capital of North Dakota. Built atop the tallest hill in Jamestown, she is three stories high with one large courtroom flanked by two circular stained glass windows. It is a building meant to inspire and impress. When I was hired to manage this site (among others), I dove headlong into its history. The courthouse was operational for almost a century, housing not only the courtroom, but the county auditor, school superintendent, and treasurer’s offices. But no historical building exists without strife. Since the birth of architecture, as long as a building stands, there also stands someone who wants to tear it down. 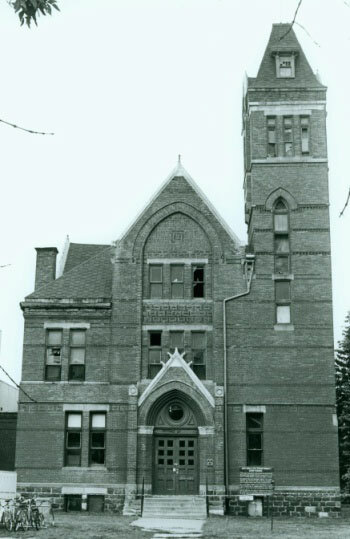 In 1983, a new courthouse was completed for Stutsman County and the 1883 building was abandoned. At this time, Stutsman County commissioners voted to demolish the historic courthouse in favor of a parking lot to accommodate the new building. In the years that followed, the city of Jamestown was divided, and the battle for the courthouse played out in the media. During this contentious time, a group of local citizens, known as the 1883 Courthouse Committee, vowed to save the historic building. Due to their heroic efforts, the building was placed on the National Register of Historic Places by the State Historical Society of North Dakota. Since the courthouse was state property, the North Dakota Century Code required approval of the State Historical Board prior to destroying historically significant state property. The board did not approve the demolition of the courthouse. But the wrecking ball still loomed. Shortly afterwards, the county challenged the board’s ruling and the case ultimately reached the State Supreme Court. After a lengthy court battle, the Supreme Court ruled in favor of the Board and the courthouse was saved. We acquired the building in 1985 and immediately got to work. What work, you may be asking? Well, imagine what would happen if you left your home standing for a four-year period—the length of time it took the courts to decide the building’s fate. During that time, it stood unheated as pigeons gained access through broken windows, rain gutters remained clogged, and water carried down the walls of the building, causing further degradation of the soft brick and mortar. The Stutsman County Courthouse was left vacant for several years, while a court battle decided her fate. During this time the building deteriorated greatly. In the years that followed, we began to implement a rehabilitation plan for the building, and the Courthouse Committee began an ambitious fundraising campaign. In the 1990s almost one million dollars were raised to repair the exterior of the courthouse. In recent years, we have invested $400,000 into the interior rehabilitation. The project is nearing completion. Still left to complete are plumbing and electrical upgrades—crucial elements to a working, usable building. So why did we save it? The Stutsman County Courthouse has great historical significance. It is not only the oldest courthouse in North Dakota—it is the oldest public building in North and South Dakota. Meetings were held there in preparation for the creation of the state of North Dakota. The courthouse truly is the birthplace of statehood. Once restored, the courthouse will be a beautiful addition to the city of Jamestown and state of North Dakota. It will operate as a historic site, educational facility and community center. As a historic site, it will tell the story of Dakota Territory, local government and how courthouses play an integral role in communities and families. As a community center, it will house weddings, concerts, meetings, and area events. 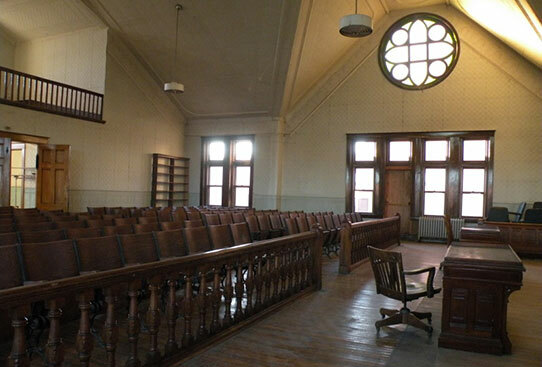 The courtroom of the Historic Stutsman County Courthouse will be a great location for community events. Walking into this building, it feels like 1883. The walls are tin, the old wood floors are scuffed and the stair treads worn. One can feel the presence of early North Dakotans—and the significant decisions that were made within those walls. More importantly, you can feel a connection to a building that has fought to stay relevant in a world that wants to tear it down. Left: Much of the hand carved wood remains at the historic courthouse. 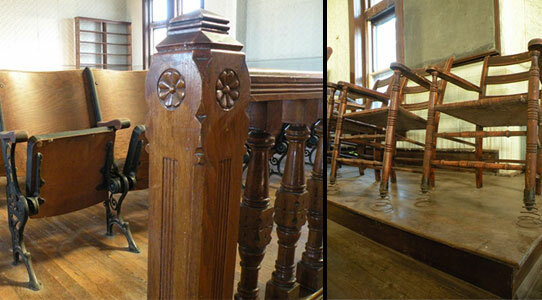 Right: The original jury chairs in the courtroom—note the springs on the front two legs. In September 2014, we held an open house to invite the community of Jamestown back to the courthouse. The 1883 Courthouse Committee and State Historical Society ambitiously planned for 200 people. At the end of the day, over 1,000 people came through the doors in just four hours. We were completely overwhelmed and surprised by the community’s support for the old building. People told us stories of adopting their children in the courtroom, obtaining their marriage and driver’s licenses there, and shared with us a plethora of other great memories. Most people had never set foot inside the building, while for several others, it had been at least three decades. There is much work yet to be done. It will take time and many hands. For 30 years, the Stutsman County Courthouse has waited. She will soon have her day.